A trip to the Far East is always a good idea and that is exactly what Microgaming is doing with Oriental Fortune. It takes you to explore the mysterious orient with their latest game. Learn a thing or two about the Asian culture and embrace the fact that we are all different depending of our location and the way we have been brought up. Aesthetically speaking this is a very good looking slot with detailed symbols and serene atmosphere. 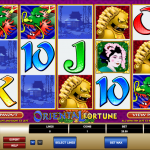 Oriental Fortune may be aesthetically pleasing but it definitely lacks in special features. Based on previous experiences we know that any slot’s popularity is according to the special feature department. But this is made on purpose because the idea was to have a game that is simple yet so pleasant to play. The only thing that will bring joy to your balance is the wild symbol which function is to substitute for every other symbol to complete a winning combination. There is a silver lining here as well. When we say every symbol we mean exactly every symbol since there is no scatter or bonus symbol here which are always more powerful than the wild symbol in other games. 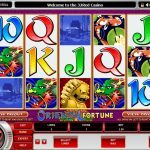 Oriental Fortune is a slot from Microgaming that is quite unique. We have a theme that has been used before but it is way improved with this game. 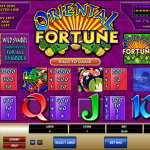 It is a simple slot that punters who avoid overcomplicated slots will love. The main focus is on the game itself so you will not be distracted or even disappointed, when let’s say for instance you wait for the third scatter to activate a feature and it never shows up. Get a taste of another world and enjoy the ride. If big jackpots matter to you then you should consider playing Rhyming Reels – Old King Cole a 5 reel slot by MicroGaming.